I've seen a number of posts about people buying their spreaders for their C22 from Dwyer, but none actually say the mount or spreader profile that they purchased. Any of you want to chime in on this? 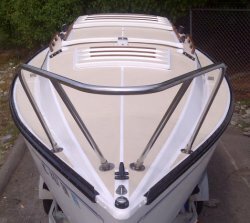 The Dwyer website doesn't seem to have a mast profile that matches the C22 being a teardrop shape about 3.6" wide and 4.7" deep. My spreader mount broke off of my '76 C22 and I need to replace it before season starts. I was going to get airfoil type from Dwyer but I don't know what to buy and they weren't much help when I called them. Thanks for this! I've been wanting to replace mine but didn't even know where to start. Why did you choose Style D over Style C? Thanks for your feedback by the way! I just got off the phone with them and they really aren't able to help much. So, I ordered the same parts as you from Dwyer..... three weeks ago! I still haven't received shipping notification. How long did it take for them to get you your new spreaders? They replied a bit ago and said they are shipping today. I know they've recently moved, so that may have had a bit to do with it. I received my spreaders last week. It did take Dwyer about three weeks to complete the order before it shipped, however I do know they were recently bought out by another company. The spreaders and brackets look great, so I'll chalk it up to moving pains. When you attached the new brackets, did you use SS rivets? It seems like that would be the way to go, but If I remember correctly I think my old brackets look like they used screws. Does anyone know how it came from the factory? I assume some 4200 is in order as well for sealing? Thanks for any help. I'll probably try to get the spreaders on next week. I'm so ready to be back on the 22!